1. Soak the whole grain flour in liquid. Substitute an acid medium such as buttermilk, yogurt, or other cultured milk such as kefir or whey for the water called for in Marilyn's Bread Recipe depending on which version you are making. (Hand, Large Mixer, or Zo method.) Lemon Juice or Vinegar may be added -- 1 TB per cup water as an alternative "acid" ingredient. Use 6 Cups flour for hand method, 14 Cups flour for Large Mixer method. As little as 7 hours soaking time will neutralize a large portion of the phytic acid in grains. 12-to 24 hours is even better with 24 hours yielding the best results. However, be flexible, soak the flour as long as you have time for so that this process fits into your routine smoothly, any soaking time improves texture, nutrition, and flavor. Just mix the liquid and water long enough to moisten the flour before the soaking time begins. This is a little bit like "sponging" but no yeast is used or any other ingredients. Cover the bowl with plastic wrap to prevent it from drying out or cover the bowl with a damp cloth. If using Saf yeast, the proofing time is not needed, otherwise allow this yeast mixture to stand 5-10 minutes to proof the yeast. 3. Thoroughly whisk together the oil, honey, and salt ingredients called for in your recipe in a 1 or 2 cup liquid measuring cup and work it into the dough with the yeast mixture until they are well blended. 4. Knead the dough as normal adding unbleached bread flour or additional whole grain flour as needed so that the dough is easily handled and knead the bread until the gluten is developed. For whole wheat bread it takes about 8 minutes kneading time in a Bosch, or 10-12 minutes of vigorous hand kneading or about 600-800 strokes. 7. 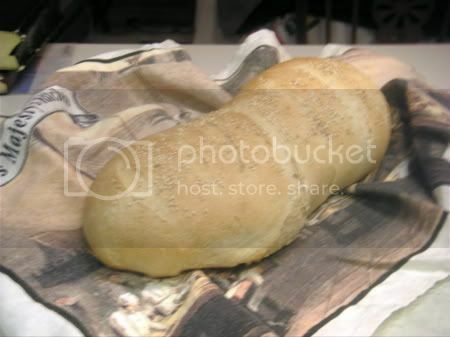 Allow the bread to double in pans; bake at 350 degrees for 30-40 minutes or until the loaf is well browned, top, sides, and bottom of the loaf. I have had several complaints lately about the 2 lb loaf recipe for the 2 stage process for the Zojirushi Machine being too big, and the top of the machine getting covered with dough and the results were very messy to clean. So I proposed to one customer how to scale back the recipe warning him that this suggestion was untested. Here is his reply after testing the recipe twice, the second time making one adjustment. 1. First, you must use the homemade program. (ed note: If your bread machine is programmable, you can adapt her method to your machine.) The following is the procedure that I use:"
2. Unplug the machine, place plastic wrap over top of the bread machine pan. Leave soaking flour mixture in the bread machine pan. Rise 2: 1 hour 25 min. Bake: 1 hour 10 min ( If I bake any less it is gummy. E. Wintegart tip: I set the "home menu" setting to 2 And 3. The "2" was the first day program and the "3" setting was for the second day, after the 24 hours. Hope this helps. I have had myZojirushi for over 5 years and had great success. Now this 2 step process has come in and I was thrown for a loop. This recipe works. Ed Note: THANKS Lisa for taking the time to perfect the 2 Stage Process for all the automatic bread machine enthusiasts! This is my husband's favorite bread! Bake in a 350� oven for 45 to 50 minutes. 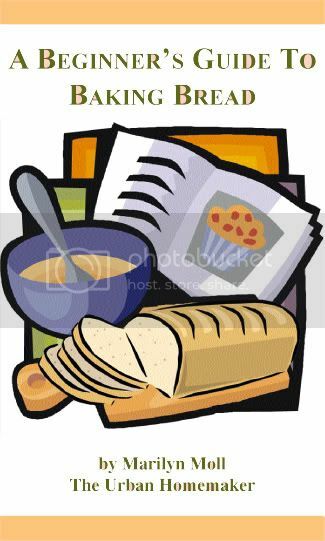 While bread is baking, combine 1/2 cup cold water and cornstarch in a small saucepan. Cook until thickened. Remove bread from oven, brush with cornstarch mixture, and return to oven for an additional 2 to 3 minutes to set the glaze. 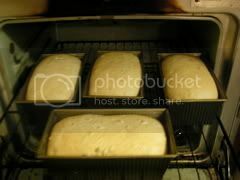 Remove from baking sheet, and place loaves on cooling rack to cool. Makes 2 loaves. Delicious with cream cheese on it. NOTE: For a lighter bread, decrease rye flour and increase wheat flour, or use 3 cups bread flour and 2 cups whole wheat flour instead of the 4 to 5 cups whole wheat flour . For more great whole grain bread recipes, tips, and information, please subscribe to From The Heart of the Urban Homemaker, it's free! To maximize nutritional value of whole grain breads and adapt this receipe to the 2 Stage Process click here. added and soaked in the liquid for at least 12 hours. This 2 Stage Process is optional and I recommend it only for experienced bakers. If you scroll down a bit, you will see how I divide up the dough, shape the loaves, raise the bread in the bread pans, bake the bread, and a finished slice. My bread doesn't always come out as well as these pictures. I have learning experiences t oo! 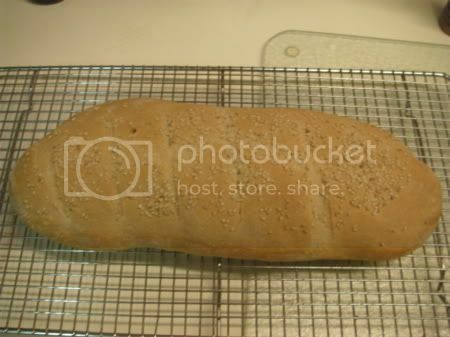 This bread contains sunflower seeds for a "nuttier" variation to my basic recipe. about 12 cups of whole wheat flour. 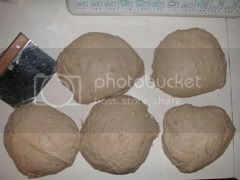 Dough is Divided into Five Equal Parts. only fills about 1/2-2/3 of the 8" bread pan. Completed Loaf. It is browned top, sides, and bottom. you use, and the amount of dough you put into each pan. Bread is also done when it reads 190 on an Instant Thermometer. 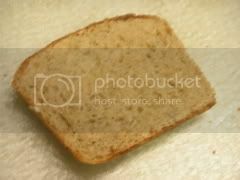 Slice of bread - The bread has even texture. Coarse bread has been raised too long. seeds in it, that is why it looks bumpy. of dental floss and place in a greased baking pan. frosting step is not pictured. These whole grain rolls are outstanding served for company meals and/or with hearty winter soups and stews. Coarsly crack wheat and rye separately in hand mill or blender. Use high speed for about 45 to 60 seconds in blender. Be certain no whole kernels remain. Combine all "Seed Mix" ingredients and cook as directed below. Bring hot water to a boil. Add Seed Mix, and cook 5 to 7 minutes, stirring constantly. Remove from heat, add butter, and set aside. Mix 3 cups flour, yeast, and dry milk in mixer bowl using kneading arm. (A large mixing bowl and heavy duty wooden spoon can be substituted for an electric mixer.) Mix well. Add water and honey to seed mixture. (Mixture should now be comfortably warm, approximately 120 .) Add this mixture to ingredients in mixer and mix about 1 minute. Turn off mixer, cover bowl, and let dough sponge 10 minutes. Add eggs and salt. Turn on mixer. Add remainder of flour, 1 cup at a time, just until dough begins to make a ball and clean the sides of the bowl. Knead 5 to 6 minutes. Dough should be pliable, smooth and elastic, but not sticky. Lightly oil hands. Shape dough into balls using about 1/4 cup dough for each. Place quite close together, but not touching, on baking sheets. Let rise until double. Bake at 350 for 18 to 22 minutes. Yields 4 to 5 dozen large rolls. Put extra rolls in freezer. Recipe may be halved. For a step by step tutorial with pictures, please CLICK HERE. These wonderful rolls will be a hit for everyday or special occasions. Halve the recipe for a small batch. Combine warm water, honey, powdered milk, and yeast in mixing bowl. Allow yeast to activate. Add eggs and 3 Cups flour. Stir until thoroughly mixed; dough will resemble cake batter. Let rest until bubbly, about 30 minutes. Add salt, oil, and remaining flour. Knead for 6-10 minutesor until gluten is developed or dough is soft and pliable. Pour out onto a lightly greased surface. Grease baking sheets. Pinch off 2-inch round portions, and roll out to an 8-inch rope. Tie rope in a single knot. 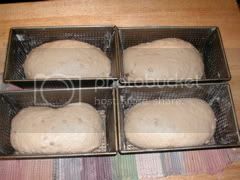 Place in rows on baking sheets, cover, and let rise until double. Bake in a 350 degree oven for 20 to 25 minutes or until lightly browned. Brush with melted butter if desired, and remove to a cooling rack. Makes 2-3 dozen. For more information, write to me at marilyn@urbanhomemaker.com or call me at 1-800-552-7323. This recipe is very basic, simple and delicious main meal accompaniment. Double this recipe for large families! Mix all the ingredients except the bread flour for one minute. Then add 2-3 cups of the bread flour (this is a higher protein refined flour; all-purpose flour may be substituted for the bread flour) until the mixture cleans the sides of the bowl. Knead for 6-10 minutes or until the gluten is fully developed. Allow the dough to rise 15-30 minutes in a covered bowl. 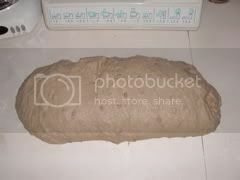 To shape the loaves: Divide the dough into two and roll each portion into a 12X15" rectangle. Roll up tightly along the long side. Pinch the edges to seal. Place on a greased cookie sheet or French Bread pans sprinkled with cornmeal. When dough doubles in size, slash the top with a serrated knife 1/4" deep every 2-3 inches. Beat one egg white with water until foamy. Use a pastry brush to coat top and sides of loaves with egg mix. Sprinkle with sesame seeds. Bake at 375�F about 25-30 Minutes or until brown. To shape bread bowls: Use 1 to 1-1/2 cups dough per "bowl". 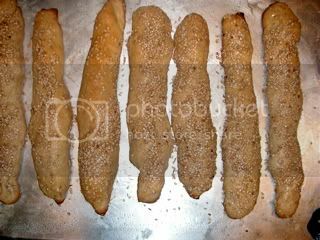 Place dough shaped bowls onto greased cookie sheet which has been sprinkled with 2 TB yellow cornmeal or semolina flour. Bake at 375�F for 25-30 minutes or until a deep golden brown color has been achieved. Either French Bread or bread bowls can be baked on a pre-heated pizza stone for a more crispy crust. Use bread bowls as a fun way to serve chili or hearty soups & stews. You can eat the dish afterwards! For more information email me at marilyn@urbanhomemaker.com or call 1-800-552-7323 or go to www.urbanhomemaker.com. Remember the children's nursery rhyme that goes as follows? Hot cross buns were sold in the street to the cry of "Hot cross buns!" around the period in English history dating back to the seventeenth and eighteenth century. A hot cross bun is a type of sweet spiced bun made with currants and leavened with yeast. It has a cross on the top which might be made in a variety of ways. Using confectioner's frosting, is the most common way. Cover currants with very hot water. Let stand about 10 minutes or up to one hour at room temperature. Drain well. In a large mixing bowl combine 2 cups flour, yeast, and cinnamon. Heat milk, oil, sugar or honey, and salt until warm (115 to 120�). Add to the dry mixture. Allow to sponge for about 15 minutes if time allows. Add eggs, one at a time. By hand or mixer, stir in currants and enough remaining flour to make a soft dough. Knead until the gluten is developed by mixer or on a lightly floured surface until smooth and elastic, about 6-10 minutes. Shape into ball. Place in greased bowl. Turn once to grease top. Cover with plastic wrap and let rise in warm place until doubled in bulk, about 1-1/2 hours. Punch down. Cover and let rest 10 minutes. Divide into 18 pieces. Form smooth balls. Place on greased baking sheet 1-1/2 inches apart. Cover; let rise until double, 30 to 45 minutes. Cut shallow cross in each. Brush tops with egg white. Bake in preheated 375� oven 12 -15 minutes. Remove from baking sheet. Use confectioner's Frosting to make a "cross" on the bun. Combine these ingredients together and add milk or water as needed to get a good pouring consistency for the frosting. Place the frosting in a small zip-lock sandwich baggie, clip the corner and use the baggie to squeeze the frosting over the cooled buns in a cross shape. Small children will enjoy this process even if it gets a little messy! 1. To learn to dye Easter eggs with natural colors, CLICK HERE. 2. Another fun Resurrection project is Resurrection Cookies. A Beginner's Guide to Baking Bread ebook by Marilyn Moll offers step-by-step instructions for getting started with baking yeast breads. Click Here to purchase this instantly downloadable ebook for $9.95. Click Here to purchase this ebook for $9.95. This hearty bread is delicious! Don't be afraid to try it. If you don't have all the seeds and grains just omit them and use additional whole wheat flour. This recipe is for an automatic bread machine and lists the order in which to add the ingredients. 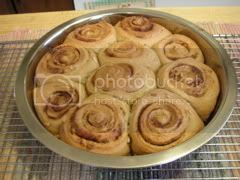 If you would like to have hot-out-of-the-oven rolls without getting up at 4:00 a.m., prepare the rolls a day ahead. Place the shaped rolls on the maple glaze and raise them overnight in the refrigerator (instead of a warm place), keeping them carefully covered with plastic wrap. In the morning, the dough should have doubled and be ready to bake. Voila! Fresh bread in minutes and you didn't even get up at 4:00 a.m. to do it! This recipe is extra delicious and healthy as it contains maple syrup and honey for sweetening instead of sugar . A fabulous gift to a new mom or new neighbors, or just for being friends. Combine yeast, dry milk powder, vital gluten, and flour in a large mixer bowl. Add water, oil, and honey. Mix well for 1-2 minutes. Turn off mixer, cover the bowl and let dough sponge for 10-15 minutes. Add eggs and salt. Turn on the mixer; add additional flour, one cup at a time, until the dough begins to clean the sides of the bowl. Knead for only 5 minutes and keep the dough very soft and manageable. (Stiff dough will produce heavy, dry rolls.) If the dough becomes stiff while kneading, drizzle additional water as you knead. To prepare sticky buns, melt butter and syrup and add the pecans. Divide this mixture evenly into the bottom of two - 9x13 baking pans. Divide the bread dough into two equal portions. Roll into a 20x28 inch rectangle. Spread 2 TB of melted butter over the rectangle of dough. Sprinkle with half the SUCANAT/cinnamon mixture. Roll up into a "jelly roll", seal the seam, and cut into 1-1 1/2 inch thick pieces with dental floss. This will yield 12-15 rolls. Place the rolls into the prepared pans. Repeat this process with the remaining dough. Let the rolls raise in a warm area until doubled (approximately 30-60 minutes). Bake at 350 degrees for 30-35 minutes or till well-browned. Remove from the oven and let stand in the pan for 5 minutes. Turn out of the pan to cool onto a rack placed over a jelly roll pan (to catch the drippings and simplify cleanup). ENJOY! In large bowl, mix 2 cups flour, sugar, undissolved yeast, lemon peel and salt. Heat milk, butter and water until hot to touch (125 to 130°F). Butter does not need to melt. Gradually add to dry ingredients. 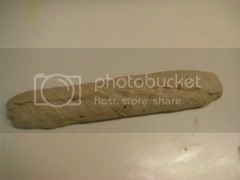 Mix thoroughly with a wooden spoon or using a dough hooks, and then stir in enough additional flour to make stiff dough. Knead by mixer or by hand on lightly floured surface until smooth and elastic, about 8 to 10 minutes. Place in greased bowl, turning to grease top. Cover; let rise until doubled in size, about 75 minutes. Punch dough down; divide in half. Roll each half to 10X15-inch rectangle. Top each with 1/2 poppy or nut filling, spreading to within 1/2-inch of edges. Roll up from long end as for jelly roll. Pinch seam and ends to seal. Place loaves on greased baking sheets. If desired, curve ends to make a horseshoe. Cover; let rise in warm, draft-free place until risen slightly, 30 to 45 minutes. Brush loaves with beaten egg. Bake at 350°F for 35 minutes or until done. Remove from baking sheets. Cool on wire racks. 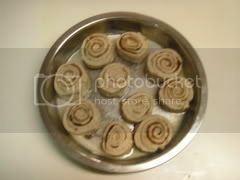 If desired, frost with confectioners' sugar frosting and garnish with additional ground nuts or poppy seed. Poppy Seed Filling: Combine 3/4 cup poppy seed, 1/4 cup milk, 1 cup sugar, and 1 tablespoon grated lemon peel in saucepan. Cover over medium heat, stirring constantly, until mixture boils (about 5 minutes); cool. Filling will thicken on standing. Increase baking time to 45 minutes; if necessary, cover with foil to prevent excess browning. Honey Nut Filling: In small bowl, combine 2 1/2 cups ground walnuts, 1/2 cup honey, 1 teaspoon vanilla extract and 1 teaspoon ground cinnamon. Blend well. Sourdough starter is easy to make, and you can make new starter anytime you want to. Acquiring some "famous" starter that has been in the family or among friends for generations or that came out of San Francisco isn't a necessity. 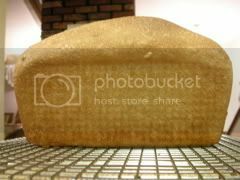 I have found that sour dough is really quite forgiving, and although recipes give basic guidelines for using sour dough starter, you can be quite flexible, and still have great results. Use your starter in any favorite bread recipe, but be patient, it takes longer to rise. 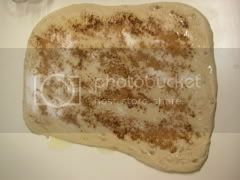 I have particularly enjoyed using my sourdough starter for pancakes, cinnamon rolls, dinner rolls, and occasionally sandwich breads. I even took my starter with me when we went camping last summer and had delicious bread baked in the dutch oven using my basic Marilyn's Famous Whole Wheat Bread Recipe using the hand method. I made the bread in the morning and baked it at dinner time. I used about 1 tsp. of yeast instead of 2 TB. 3. Cover loosely with plastic wrap or cheesecloth; let stand in a corner 2-6 days. Stir down with non-metal spoon as it bubbles up. A day or two longer may be needed if the weather is cool. Top of the refrigerator is usually a warm place. 4. Store the starter in a glass or crock container in the refrigerator, at least 12 hours before using. 5. To use Refrigerated starter: Remove starter from refrigerator, stir down any dark liquid, bring portion to be used to room temperature (always reserve an unused portion for step #6). 6. Replenish the unused starter with equal parts of warm water and flour about 1/2-1 cup of each. Cover loosely and refrigerate. After you have replenished the starter give it at least 24 hours before using it again. Dark liquid rises to the top can be stirred back in, it is not a sign of failed or spoiled starter. If mold appears, remove it. Discard starter only if any pink color is present. 1. Freeze it in 1 cup portions. 2. Throw half away and replenish the remainder (see step #6) . Repeat with unsued starter periodically. 3. Discard it and make new starter, if needed. 4. I have found the more often I use the starter the better, but I have not used the starter for months at a time, and it always comes back to life, as long as refrigerated. Sourdough starter can be used in English muffins, yeast breads, and rolls using these general guidelines. 1. Use 1/2-1 cup starter. Reduce liquid and flour in the recipe by same amount that is in the starter. 2. Replenish leftover sourdough starter and return to refrigerator (step #6, p.36). 4. In the morning blend in remaining ingredients. Active dry yeast can be omitted for a natural leaven bread, or reduce the amount of yeast used in the recipe by 1/3. For example, if the recipe calls for 3 TB yeast, I use 1 TB. Sourdough starter may be used in any pancake, waffle, biscuit, or muffin recipe. The above information is adapted from Sue Gregg's Yeast Breads Book. If you have any additional questions about baking with sourdough, just contact me at marilyn@urbanhomemaker.com or call us at 1-800-552-7323. Free 64 page catalogs of all of our products and much more are available at http://www.urbanhomemaker.com/catalog. Here is the method for making Sprouted Grain for 100% Sprouted Wheat Bread and other recipes. Large amounts of grain can be sprouted ahead, dried, and stored until needed. Sprouted (or soaked) grain is used in four recipes in Yeast Breads: 100% Sprouted Wheat Bread, Sprouted Rye-Wheat Bread, Sprouted Oat-Wheat Bread, and Ezekiel's Bread. Sprouted grain can be used in other recipes as well. #1 sprouted grain gives the bread a distinct sweet sprouted grain flavor. #2 Soaked Grain gives the bread a slightly "sourdough" flavor. Preparation Tips: Part of the grain used in the sprouted bread recipes is used moist and part of it is used dried and milled into flour. Any amount of sprouted or soaked grain to be used dried and milled into flour can be prepared in advance and stored after drying. 2. Drain, Saving soaking water to use as hot liquid in bread recipe (refrigerate until needed). 3. Sprout Grain for 1 day only for very short sprouts - 1/16" to 1/8" long; keep grain well drained, but damp, watering it twice. 4. Store 2 cups sprouted grain in refrigerator in tightly covered container until needed (not over a day or two). 5. Thoroughly Dry Out remaining grain. 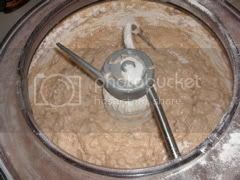 When thoroughly dried, mill into flour (any dried grain not to be used immediately may be stored in tightly covered container in cool place; do not mill into flour until ready to use). Grain may be dried in a dehydrator at low temperatures to preserve nutrients or in a warmed oven. 6. Use moist refrigerated grain and milled flour as directed in specific recipes. 1. Using same amount of grain and water as step #1 above; cover container with loose fitting lid; soak for 3 days at room temperature. 2. Proceed with steps #2, 4-6 of Method #1 above. The above information comes from p. 64 Yeast Breads by Sue Gregg of Sue Gregg Cookbooks. Used by permission. 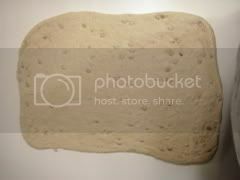 Any basic bread dough can be made into many tasty variations limited only by your imagination. 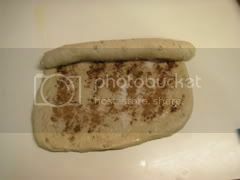 Why not try Marilyn's Whole Wheat Bread recipe for a basic bread dough and fashion it into pizza, cinnamon rolls, bread sticks, onion cheese bread, etc? Use approximately one loaf of bread dough(1 1/2 pounds dough) for each pizza crust. If you are not baking the crust on a Pizza Stone, you will be much more successful if you pre-bake the crust for 6-8 minutes, and then cover it with toppings of your choice. Be sure to have all your toppings ready, or wrap and freeze pizza crusts for future meals. Pinch dough off into walnut size balls. Dip in melted butter and then roll in cinnamon sugar mixture (1T cinnamon to 1/2 C. sugar or sucanat). Place balls in layers, at least two layers or one-half to two thirds full), in a regular loaf pan or bunt pan. Let rise until doubled in bulk, bake at 350� for 20-30 minutes. Make caramel sauce by melting 1/4 cup butter, 1/2 Cup brown sugar, and 1/2 C. maple syrup in a saucepan, add 1/2 cup chopped walnuts or pecans if desired. Pour this mixture into the bottom of a bundt pan or 9X13" baking pan. 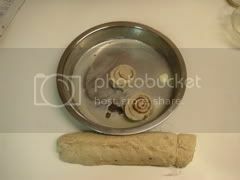 Place walnuts sized pieces of dough in layers in the pan. Let rise until doubled, bake at 350� for 20-30 minutes. For each loaf of bread, cut in 1 T caraway seed and 1 tsp. anise seed. Roll 1/2 Cup portions of dough into finger-thin ropes and cut to the desired length. Brush with melted butter. Sprinkle with a desired topping: Parmesan cheese, garlic salt, or powder, Italian Seasonings, sesame seeds, etc. Place the "sticks" onto a lightly greased baking sheet, about 2 inches apart. Let rise 10-15 minutes. Bake at 375 degrees for 18-18 minutes. For each loaf, knead in 1/4 cup chopped onion (or reconstituted minced onion) and 1/2 C. grated, sharp, cheddar cheese. Proceed with regular rising and baking. Knead in 1/2 cup raisins and 1/2 cup chopped walnuts or pecans plus 1 1/2 tsp. cinnamon. For each loaf, add 1/3 cup parmesan cheese and 1 tsp. garlic powder or more to taste, and 1 tsp. of herb of choice (optional). Add 1/2 Cup grated sharp cheese, 2 TB ranch salad dressing mix, and 2 chopped fresh jalapeno peppers. Add 1 TB onion powder. Roll to slightly less than 1/2 inch thickness and cut with a can about 4 inches diameter. (Cut out both ends for air to escape) If desired, moisten the top of buns and sprinkle with onion flakes before rising. Bake 18-20 minutes at 350�. For each loaf, add 2 slightly heaping tablespoons of dried onion flakes (or 1 TB onion powder) and 2 tsp. dill weed. For each loaf, add 3 TB snipped dried tomatoes, 1 tsp. crushed rosemary, and 1/4 tsp. paprika. In a medium mixing bowl, combine 2 C. finely chopped or grated apple, 1/2 C. raisins or dates, 2 T honey or brown sugar, 2 tsp. cinnamon or apple pie spice, dash of salt. For each loaf of bread, roll out the dough into a 12 X 18 rectangle, spread the apple mixture over the dough, roll up tightly, seal the roll, and cut rolls into 3/4-1 inch slices with dental floss.